In the 10 years I’ve been working with projects in the Australian construction industry, the default I’ve seen for project controls reporting has typically involved bringing together cost and progress data on a monthly basis to make decisions and keep projects on track. I’ve been one of those cost engineers, combining financial transaction data, schedule data and progress trackers into one massive spreadsheet to report on the end-of-month position. While the report may look pretty, once it’s published, costs are often at least six weeks out of date and validity is dependent on the quality of accruals. And, when an issue is identified, the opportunity to correct it and save time and money has long passed. Shorter timeframe reporting and performance analysis is rarely aggregated and reported holistically because of the sheer effort involved. Have you ever tried getting a meeting near the end of month with a project delivery team member? If you have, you will know you need to plan around the end-of-month cycle. One project manager described it to me as the project controls end-of-month crescendo: the two weeks leading up to month end involve getting data into the project controls system, the two weeks after month end involve cleaning data to finalise reports, and then the cycle starts again. What’s more, this never-ending cycle couldn’t possibly be delivered on a weekly basis. Senior project engineers in Tier 1 contracting organisations often spend a significant amount of time (up to four days) each month determining their cost and progress positions. About 70% of that time is spent determining their cost position and accruals and only 30% on forecasting and developing strategies for correcting or optimising their position. The biggest driver is often cited as a lack of trust in project cost and progress data from spreadsheet to spreadsheet and system to system, so they develop their own spreadsheets – in some cases from first principles. Achieving trust in a single data set delivers significant efficiency benefits among many others. End-of-month progress is typically pretty accurate toward the end of a month. However, a true record of costs for that same period is not just the actual costs in the finance system, because there are often costs linked to earned progress that have not yet had invoices submitted. This compounds when work is spread across numerous subcontractors working off paper dockets. When progress and cost data are split across multiple sources and only reported monthly, it can take months between finding a data problem, fixing it and then having confidence in the data again. With data sometimes two to three people removed from the source of capture, the message may not even get back to the source to correct the data and produce a robust record for informed decision-making. 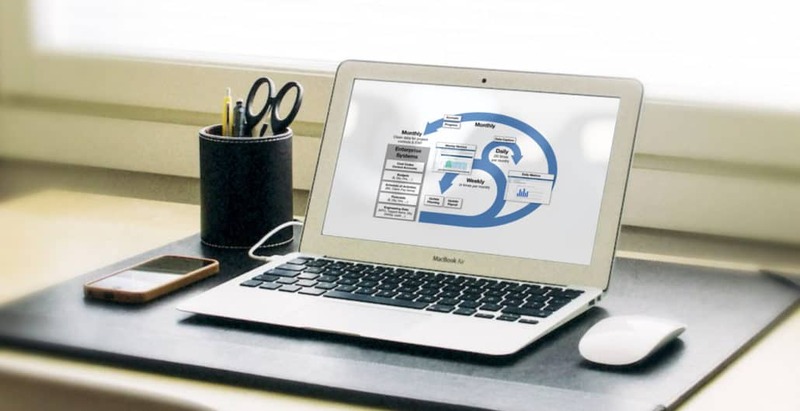 Rapid data verification cycles are critical to risk and issues management and continual improvement. 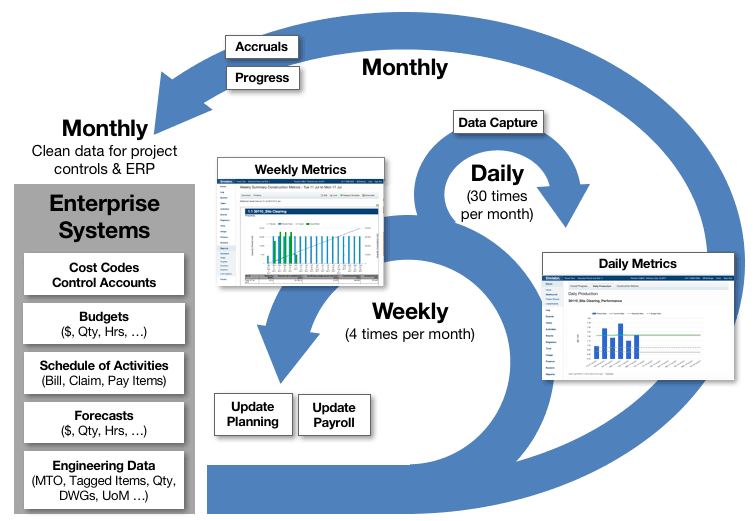 The ideal reporting cycle comprises a layered approach involving different members of a project delivery team at daily, weekly and monthly intervals. This generates the highest quality metrics with the least effort on those daily, weekly and monthly cycles. Daily performance metrics, such as daily costing unit rates and daily quantity installation productivity metrics, should be generated by relevant engineers and foremen to drive field production and quickly identify when targets are not being met. This daily practice should identify missing data or other issues for weekly reporting and, on a bigger scale, empower corrective actions to be taken, faster, to keep scope on track. Progress and cost data that are not available daily, should be recorded ahead of the weekly report. Weekly reporting metrics, such as s-curves and earned value tables, should be presented to project leaders so that trends, improvement opportunities and learnings can be identified and informed decisions made regarding corrections to keep a project on track. From a data perspective, anomalies identified can be corrected ahead of the next reporting cycle. Progress and costs that are only available on a monthly basis get addressed at this point. For example, subcontractor progress claims for lump sum and schedule of rates contracts can be submitted and assessed by the contractor, and subcontractor invoices submitted for services delivered during that month. Services receipted during the month but not invoiced can also be entered into the finance system as accruals so the cost and progress positions at month end are aligned. This ensures cost performance can be accurately assessed. Ideal monthly reporting metrics should provide a complete picture of all works and confirm trends seen during the previous weekly reports. The three weekly reporting cycles leading into the end of month should provide leaders with confidence in their position and allow informed decision-making and forecasting. Envision is the leading project delivery platform for energy, resources and civil infrastructure projects when it comes to supporting the challenges of monthly reporting. Features that drive easy daily and weekly reporting help keep projects on track while reducing the administrative staff required to support project reporting. End of month project controls reporting is significantly enhanced with integrated daily and weekly field updates. Achieving that integration between daily, weekly and monthly reporting, based on a single source of project data, builds greater confidence and trust between project parties and enables project management teams to drive significant cost and schedule savings. 7 years in review: A fireside chat with Envision’s CEO Is the construction foreman’s paper diary dead?